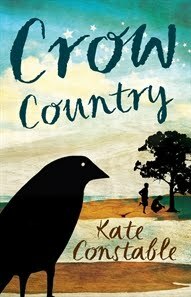 In Kate Constable’s Crow Country (Allen and Unwin), Sadie and her mother have moved from their lovely Melbourne home by the sea to Boort, her mother’s home town in regional Victoria, where there is a drought. Boort has a history, both for her mother and further back. The same families have lived in the town for the last century and more. The local artificial lake has dried up, leaving behind some old graves and indigenous relics. When Sadie is exploring the dried lake bed, with its small cemetery and a circle of stones set up by the indigenous people, she finds herself confronting Waa the Crow, the local totem bird. A past tragedy has influenced the present. Sadie must find the end to that story, which is dark to the Crow. Time-slipping back to the 1930s, when her mother’s grandparents were running the local store, Sadie discovers the truth behind the tragedy. The key to the story’s end lies in the present -- and she will need help to find it. Kate Constable is a master of the time-slip fantasy. Actually, she seems to do fantasy pretty well whatever it is. Whether it’s the present-day fantasy of this one and Cicada Summer or the Tamora Pierce-style world-building of the Chanters of Tremaris series, she creates a wonderful sense of the fantastical and characters you can care about. In this case, we have not only the time-slip but the indigenous theme and the reminder that the racism of the past hasn’t gone away in our own time. Sue Bursztynski lives in Australia, where she works as a teacher-librarian. She has written several books for children and young adults, including Crime Time: Australians Behaving Badly and, most recently, the YA novel Wolfborn. Her blog, The Great Raven, can be found at http://suebursztynski.blogspot.com.